Well, we can put the rumors about Bob Stoops flirting with Florida to rest. 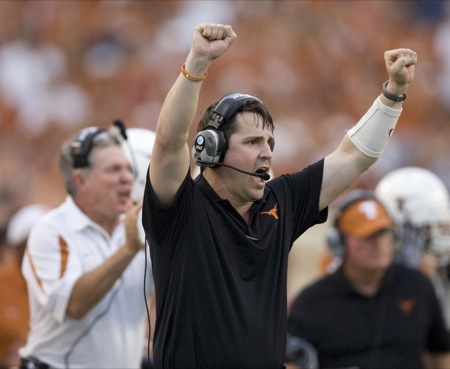 In what has to be music to the ears of Sooner Nation, not only is Stoops not heading to Gainesville, but Texas defensive coordinator Will Muschamp is. The Internet nearly exploded this evening when news broke that UT coach-in-waiting Will Muschamp had abdicated his claim to Mack Brown's throne. Honestly, it sounds like the news blindsided everyone, including the UT higher-ups. Personally, I never really bought into the idea that Coach Boom would be Nick Saban 2.0, despite the pedigree. Yet, there's no doubt that Muschamp had infused a toughness and grit into Texas' program that is lacking in Mack's DNA. From the 10,000-foot view, today's news serves as the most obvious sign yet that Bellmont is burning. A 5-7 season is embarrassing. Canning longtime coaches can be explained away as progress in the wake of a come-to-Jesus moment. But, when the Chosen One turns his back on you? That has to hurt. Texas fans can take solace in the fact that just 20 days remain in the worst year in recent memory for Longhorn football.